A new experiment at the SLAC National Accelerator Laboratory revealed a 3D grid of quantum “tornadoes” inside microscopic droplets of supercooled liquid helium, allowing scientists to see a manifestation of the quantum world on a macroscopic scale for the first time. 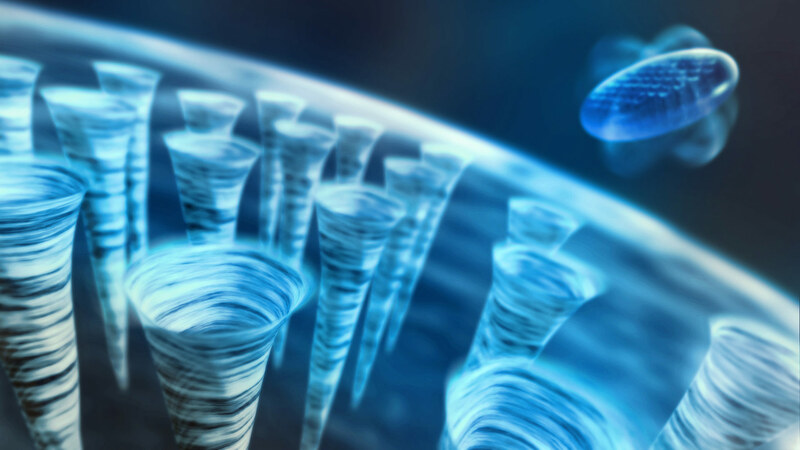 Menlo Park, California — An experiment at the Department of Energy’s SLAC National Accelerator Laboratory revealed a well-organized 3D grid of quantum “tornadoes” inside microscopic droplets of supercooled liquid helium – the first time this formation has been seen at such a tiny scale. The results, detailed in the August 22 issue of Science, could help shed light on similar quantum states, such as those in superconducting materials that conduct electricity with 100 percent efficiency or the strange collectives of particles, dubbed Bose-Einstein condensates, which act as a single unit. Other research collaborators were from the Stanford PULSE Institute; University of California, Berkeley; the Max Planck Society; Center for Free-Electron Laser Science at DESY; PNSensor GmbH; Chinese University of Hong Kong; and Kansas State University. This work was supported by the National Science Foundation, the U.S. Department of Energy Office of Science and the Max Planck Society. 1 Comment on "Mysterious 3D Grid of Quantum “Tornadoes” in Liquid Helium Revealed"
Promising implications for future nano-scale molecular inspection, at the very least. I’m probably not alone, however, in thinking that an array of quantum tornadoes is just plain cool.